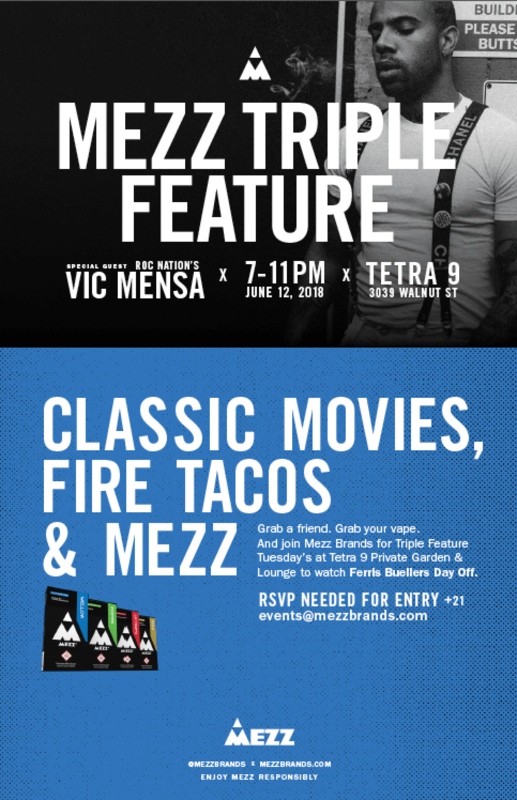 Mezz Triple Feature - Cannabis, Movies and Music (Ferris Buellers Day Off) + Special Guest Vic Mensa Tetra 9 Lounge 3039 Walnut St.
Bueller, Bueller, Bueller….. Join Mezz Brands for a triple feature evening of Cannabis, Movies, and Music with very special guest Vic Mensa. BYOG – Grab your Mezz vape and pull up to Tetra 9 Members Club to catch a flick and hang with local high-minded cinephiles. Ferris Bueller’s Day Off – Ferris Bueller (Matthew Broderick) has an uncanny skill at cutting classes and getting away with it. Intending to make one last duck-out before graduation, Ferris calls in sick, “borrows” a Ferrari, and embarks on a one-day journey through the streets of Chicago. On Ferris’ trail is high school principal Rooney (Jeffrey Jones), determined to catch him in the act.